Phaius SUBFAMILY Epidendroideae, TRIBE Arethuseae, SUBTRIBE Bletiinae. This genus is composed of 40-50 species widespread through Africa to the Philippines and the Pacific Islands. It is a wide spread genus that for the most part has a pleasing vegatative appearance even out of bloom They are mostly shade loving and terrestrial with a few epiphytes and generally like even watering [see individual species listing]. When in their growth phase weekly fertilizer is reccomended year round. Phaius are sympodial and most often terrestrial, with highly varialble plant size. The pseudobulbs are small with new growths arising from the base of the pseudobulb or from the rhizome. They have large plicate leaves that can be ruffled as well and generally have a pretty out of bloom appearance. The inflorescence arises from the base of the old pseudobulb or from the rhizome and has its flowers racemose at the end of the spike. Phaius in general has large showy flowers with a pleasant fragrance. New plants can be obtained from the old spikes, just lay the spike out in a plastic flat filled with sand and half cover them. Keep in a shady moist area and in 1-2 months the new plants will appear from the nodes of the spike. 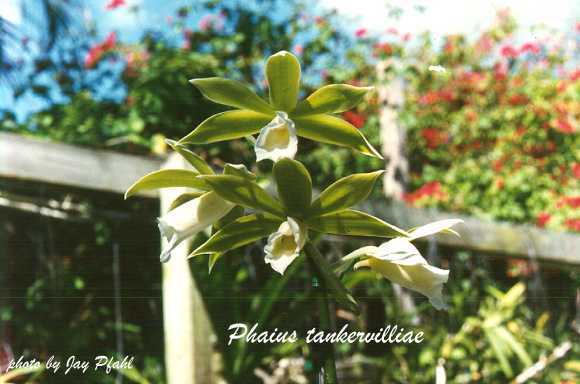 The phaius from Madagascar are also listed in the genus Gastorchis and in the list below are noted with an *. * indicates species that may or were included in Gastorchis depending on who you listen to. - India, Thailand, Malaysia, China, Japan, Taiwan and the Philippines - Alt 1220m-1768m - Flowers in Dec-May, July-Aug and Oct - Terrestrial - High swampy forest - shaded light - more water May-Oct., less water Nov-Apr. - May be conspecific with P. wallichii aka P. tankervilleae - Zaire Africa - Terrestrial - More water May-Nov.